The Social Network is David Fincher's latest film, about the birth and flowering of Facebook, the social networking behemoth of the Internets. Fincher (Seven, Fight Club, Zodiac) is nothing if not unpredictable in his choices. How could such a seemingly dry subject be of interest to his agile camera? But then, you're talking about the director who adapted an old F. Scott Fitzgerald short story into a full-length feature film with Brad Pitt. 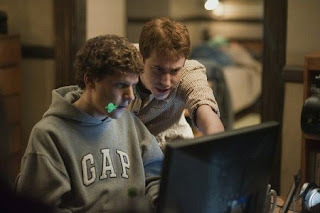 Jessie Eisenberg plays Mark Zuckerberg, the co-founder of the website. I first saw him in Zombieland, and though that movie was a slight comedy at best, Eisenberg made me like it even less. His performance seemed one note and hypermanic. He's in more comfortable territory here. Maybe it's because I'm not supposed to like his character anyway, I'm not sure. Aaron Sorkin wrote the script, and right off the bat you can tell it's his baby. The opening scene takes place in a bar between Zuckerberg and his girlfriend in college, and the actors are nearly breathless delivering the dense dialogue. I found myself making an effort to keep up and stay focused on what they were saying. Thankfully, the rest of the movie is not so dizzying. I never saw West Wing, but I recall clearly the same effect taking place in Sorkin's first notable series, Sports Night. The story gets played out in depositions given by the main players in the drama. Zuckerberg goes back to his dorm one night and whips up the code for a Harvard website that asks the user to rate pictures of two women on campus side by side. His effort attracts the attention of a pair of twins, played by one actor in the movie, Armie Hammer. His role is digitally worked to create the effect of him being two separate people in the same frame. It's reminiscent of the backwards aging trick he pulled with Pitt in Benjamin Button. Supposedly, the twins have an idea for this Facebook-like site, and they try to enlist Zuckerberg to write the code for it. Zuckerberg avoids the twins for weeks and even unveils Facebook before he has another meeting with them. As the site's success mushrooms, it's not hard to see where the depositions become involved. It was interesting to learn that Sean Parker, the founder of Napster, was involved with the site in its very early stages. Justin Timberlake plays him in the film, and he's better than you might think. He's portrayed as extremely narcissistic, and his contribution is difficult to figure out (other than a minor name change). Zuckerberg's original, and as the film implies, only, friend, Eduardo Saverin, is the decent guy left out in the cold. He provides the lion's share of the seed money for the site, and by the end he's suing his estranged friend just to get the credit he deserves. I've heard that the film plays a little loose with the facts, but it didn't lessen my fascination with the story. With its depiction of Harvard, you feel as if you're getting a glimpse into the insular lives of America's elite. The twins are nonplussed that something could actually be going wrong for them. Parker glides through the film, confessing that he hasn't made much money from his venture, yet still getting celebrity treatment at restaurants and clubs. Saverin resents him for it and seems to be the only one who can see that he's really just a hanger-on. Trent Reznor, aka Nine Inch Nails, scored the movie, and it's an effective soundtrack to the proceedings. It's very blippy and techno. At one point, there's a transition into a San Francisco nightclub, and in the theater the music suddenly boomed out of the speakers. It actually sounded as loud as what you'd hear at a club. I waited for someone to get up and liquid dance. Sadly, no one did. I'd recommend this one, even if you don't write code. It's sharply written, Fincher keeps the story moving as fluidly as possible, and it's a window into a world most of us never see.